An atomic war seemed to be coming at that time and many artists of quality were expressing the idea in their work that destruction and devastation were inevitable. I felt I should go the other way … It’s either optimism or resign yourself to going under. The sculpture has been on almost constant display in the ‘Victory over Japan’ section in the Second World War galleries at the Memorial. The exhibit evokes the mixed emotions that arise in response to this history: joy at the end of the war, but sadness and revulsion that nuclear bombs – indiscriminate bringers of mass death – were required. The display, towards the end of the galleries, combines Listening angel with photographs and footage from Hiroshima and Nagasaki; partially melted domestic objects unearthed from the ruins of Hiroshima; historical quotes and exhibition text describing the events and the range of responses; and a large number of origami paper cranes, a symbol of peace and the hope for a future free of nuclear conflict. Listening angel sits in the centre of this material and offers the viewer an opportunity for pause and reflection. The stillness and apparent passivity of the listening pose is ambiguous. Perhaps it is an expression of Perceval’s belief in humanity’s ability to listen and negotiate alternatives to conflict. Maybe the angel listens to the voices of the hundreds of thousands of innocent victims, gone in an instant, when the bombs exploded. Listening angel and the objects found amidst the ruins of Hiroshima together create a terrible beauty. The fused and melted glass, ceramic and metal objects, including tea cups, glass bottles and ink wells, are still recognisable but transformed by the heat of the blast into records of the searing temperatures and horrifying power of these weapons. 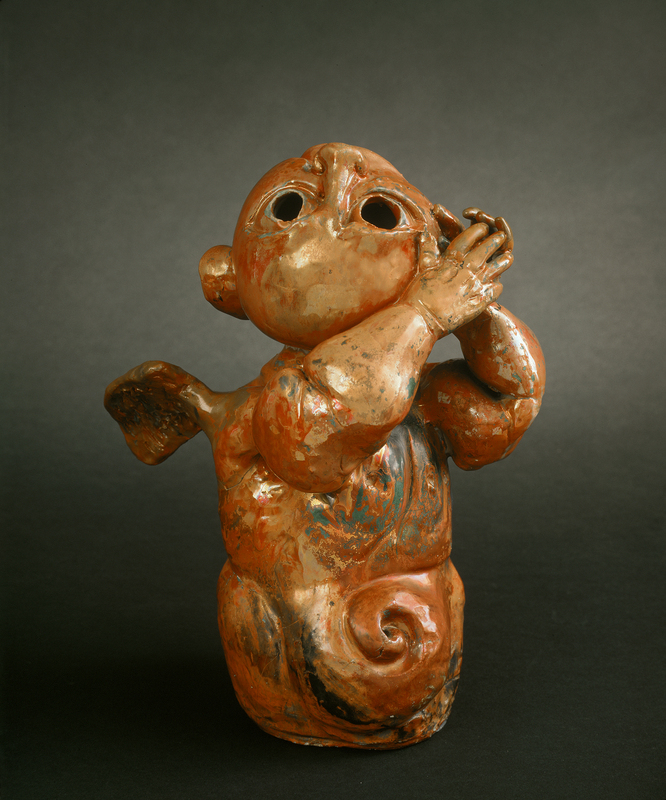 These forms and surfaces are echoed by the glazed earthenware of Listening angel. The same transforming power of heat, but here in the kiln at Murrumbeena, used to create beauty as an expression of hope. Perceval in an interview with John Hetherington, 1962, quoted in Traudi Allen, John Perceval, Melbourne University Press, Melbourne, 1992, p. 129.